Take advantage of "windows of opportunity" (weather, etc.) No YES! 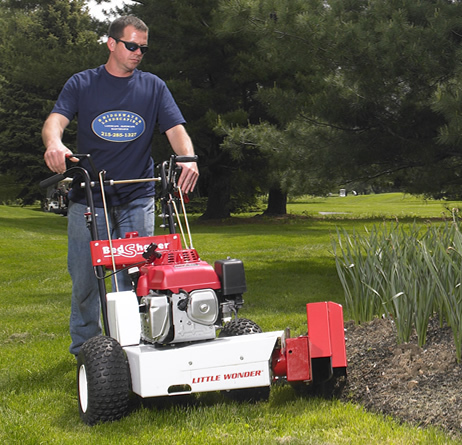 80001 To further increase productivity, the bolt-on Shredder Blades break up sod strips for one-step edging. This kit is designed for sandy or loamy soils. 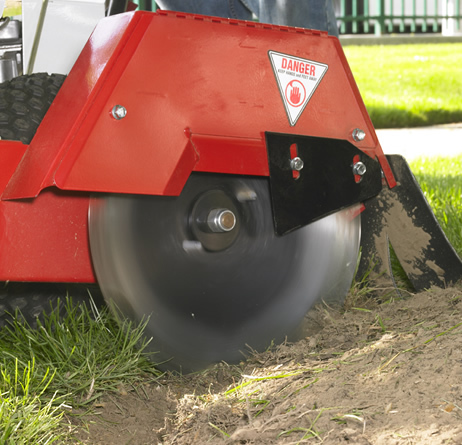 80002 When encountering extra hard or compacted soil, the 16 pound Weight Kit helps keep the blade in the ground. The Little Wonder BedShaper® is guaranteed against defects in material and workmanship for a period of TWO YEARS from date of purchase. Any Little Wonder BedShaper® or part found to be defective within the warranty period is to be returned to any registered Little Wonder dealer. Ed Reilly’s crew replaced a contractor who edged beds at Fairway Mews in New Jersey with a crew of three. It took two weeks to complete the job on 24 acres of residential turf and 118 acres of golf course. Two years ago, he chose the Bedshaper based on its reputation as a productive edger with minimal requirements for maintenance and repair. He saw the machine demonstrated and bought it. Today, one man on Ed’s crew can complete all the edging in just one week, resulting in such a significant savings that the BedShaper paid for itself in just two weeks. When you edge at least 30 linear miles of predominantly curved beds per year, the equipment you use is crucial. At Willow Valley Resort & Conference Center in Lancaster, Pennsylvania, Grounds Supervisor Jim Nagle knows the BedShaper is the perfect tool. A demanding grounds maintenance schedule is necessary at Willow Valley which functions as a destination resort with a nine-hole public golf course as well as a retirement community with a variety of options for living. With 500 acres of gardens and landscaped areas divided into segments according to function, Willow Valley also encompasses a business park and shopping center. All areas see the BedShaper on a regular basis, resulting in Willow Valley’s reputation as a showplace in the heart of the Pennsylvania Amish country. Purchased to replace an inefficient edger that was also difficult to use, the BedShaper arrived just before the 2001 season. With a team of 15 full time groundskeepers and 8 seasonal workers, Jim put the BedShaper to work and immediately realized a significant savings in labor. 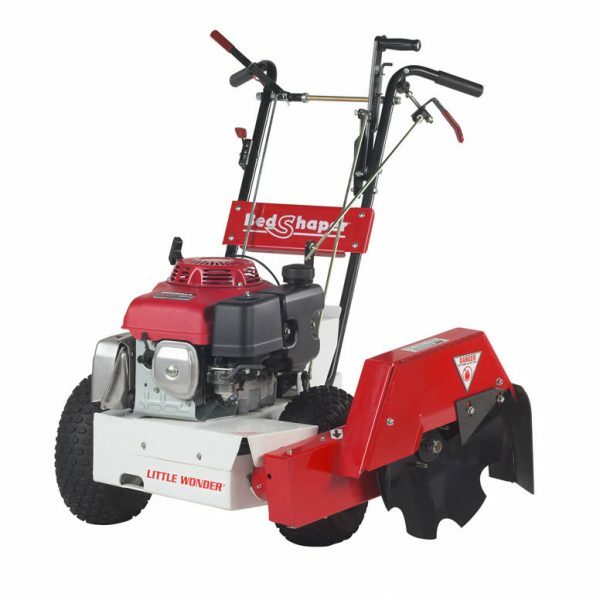 The self-propelled BedShaper works faster and, because it rolls the edging back in a single piece, cleanup is instant. With hydrostatic transmission, uneven terrain is no problem, and edging around trees went quickly due to the BedShaper’s capability to turn a tight radius.